, the most illustrious of the Greek philosophers, and whose sect outlived every other, was by descent an Athenian, but born in the island of Ægina, then subject to Athens. His origin is traced back, on his father Aristo’s side, to Codrus; and on that of his mother Pericthiohe, through five generations, to Solon. The time of his birth is commonly placed in the first year of the eighty-eighth olympiad, or B.C. 428; but Brucker thinks, it may perhaps be more accurately fixed in the third year of the eighty-seventh olympiad, or B. C. 430. He gave early indications of an extensive and original genius, and was instructed in the rudiments of letters by the grammarian Dionysius, and trained in athletic exercises by Aristo of Argos. He applied also with great diligence to the arts of painting and poetry, and produced an epic poem, which he had the wisdom afterwards, upon comparing it with Homer, to commit to the flames. At the age of twenty years, he composed a dramatic piece, which was about to be performed on the theatre, but the day before the | intended exhibition, he happened to hear a discourse of Socrates, which induced him to withdraw the piece, and relinquish the muses for the study of philosophy. Accordingly he became a regular pupil of Socrates for eight years, and although he sometimes mixed foreign tenets with those of his master, always preserved a strong attachment to him, and attended him at his trial. During the imprisonment also of that celebrated philosopher, Plato had an opportunity of hearing his sentiments on the immortality of the soul, the substance of which he inserted in his beautiful dialogue entitled “Phajdo,” along with some of his own peculiar opinions. On the death of Socrates, he retired, with other friends of Socrates, to Megara, where they were hospitably entertained by Euclid, who taught Plato the art of reasoning, and probably increased his fondness for disputation. Desirous of making himself master of all the wisdom and learning which the age could furnish, Plato commenced his travels with visiting that part of Italy, called Magna Græcia, where he was instructed in all the mysteries of the Pythagorean system, the subtleties of which he afterwards too freely blended with the more simple doctrine of Socrates. He next visited Theodorus of Gyrene, and when under this master he found himself sufficiently instructed in the elements of mathematics, he determined to study astronomy, and other sciences, in Egypt, and that he might travel with safety, he assumed the character of a merchant. 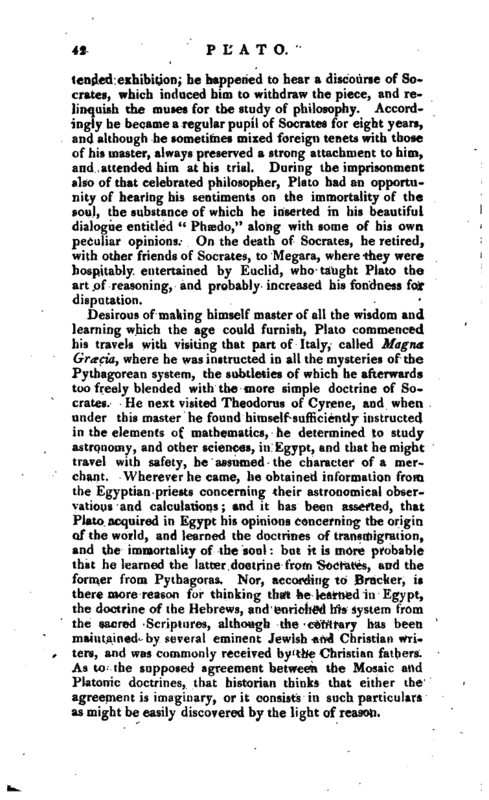 Wherever he came, he obtained information from the Egyptian priests concerning their astronomical observations and calculations; and it has been asserted, that Plato acquired in Egypt his opinions concerning the origin of the world, and learned the doctrines of transmigration, and the immortality of the soul: but it is more probable that he learned the latter doctrine from Socrates, and the former from Pythagoras. Nor, according to Brucker, is there more reason for thinking that he learned in Egypt, the doctrine of the Hebrews, and enriched his system from the sacred Scriptures, although the contrary has been maintained by several eminent Jewish and Christian writers, and was commonly received by the Christian fathers. As to the supposed agreement between the Mosaic and Platonic doctrines, that historian thinks that either the agreement is imaginary, or it consists in such particulars as might be easily discovered by the light of reason. | After learning what distant countries could teach, Plato returned to Italy, to the Pythagorean school at Tarentum, where he endeavoured to improve his own system, by a mixture of the Pythagorean, as then taught by Archytas, TimsEus, and others. 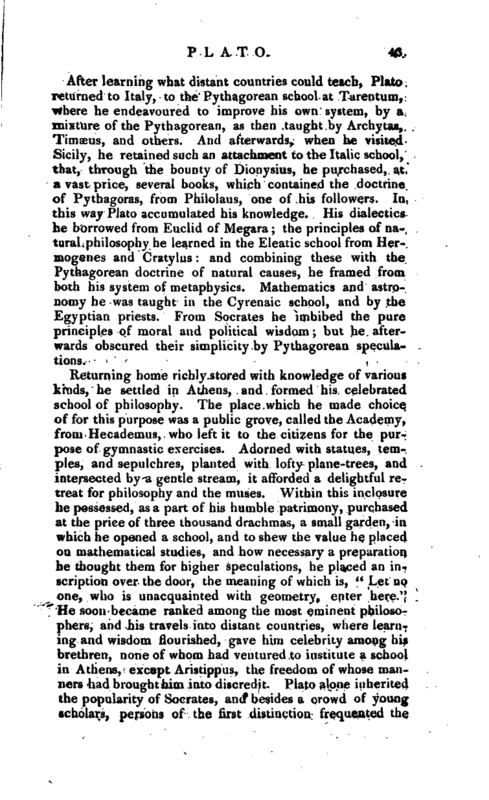 And afterwards, when he visited Sicily, he retained such an attachment to the Italic school, that, through the bounty of Dionysius, he purchased, at a vast price, several books, which contained the doctrine of Pythagoras, from Philolaus, one of his followers. In this way Plato accumulated his knowledge. His dialectics he borrowed from Euclid of Megara; the principles of natural philosophy he learned in the Eleatic school from Hermogenes and Cratylus: and combining these with the Pythagorean doctrine of natural causes, he framed from both his system of metaphysics. Mathematics and astronomy he was taught in the Cyrenaic school, and by the Egyptian priests. From Socrates he imbibed the pure principles of moral and political wisdom; but he afterwards obscured their simplicity by Pythagorean speculations. The professed object of Plato’s first visit to Sicily, which happened in the fortieth year of his age, during the reign of the elder Dionysius, the son of Hermocrates, was, to take a survey of the island, and particularly to observe the wonders of Mount Etna. Whilst he was resident at Syracuse, he was employed in the instruction of Dion, the king’s brother-in-law, who possessed excellent abilities, but had not escaped the general depravity of the court. Such, however, was the influence of Plato’s instructions, that he became an ardent lover of wisdom, and hoping that philosophy might produce the same effect upon Dionysius, he procured an interview between Plato and the tyrant. This had like to have proved fatal, for Donysius, perceiving that the philosopher levelled his discourse against the vices and cruelties of his reign, dismissed him with high displeasure from his presence, and conceived a design against his life. And although he did not accomplish this barbarous intention, he procured him to be sold as a slave in the island of Ægina, the inhabitants of which were then at war with the Athenians. Plato, however, could not long remain unnoticed: Anicerris, a Cyrenaic | philosopher, who happened to be at that time in the island, discovered him, and purchasing his freedom, sent him home to Athens, and afterwards refused the repayment of the purchase-money, that, as he said, Plato’s friends might not monopolize the honour of serving so illustrious a philosopher. After a short interval, Dionysius, repenting of his unjust resentment, wrote to Plato, inviting him to return to Syracuse, to which Plato answered, with some contempt, that philosophy would not allow him leisure to think of Dionysius. He was induced, however, to return by another expedient. 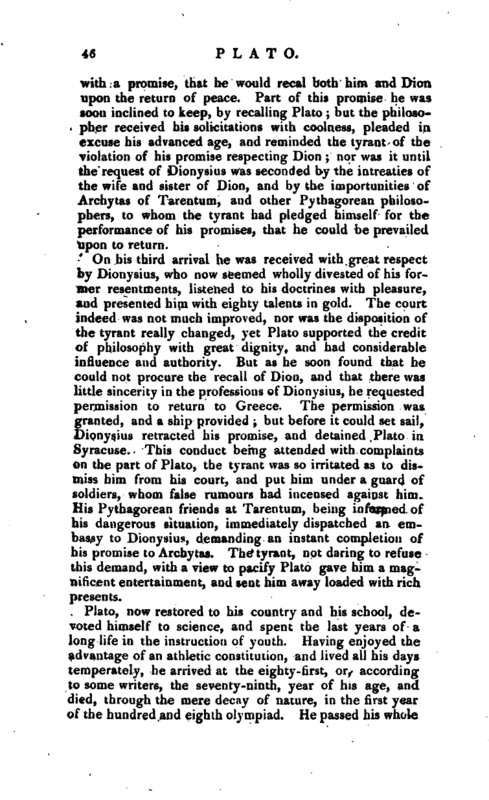 Plato had made Dion a determined votary of virtue, and he naturally wished to extend this advantage to the younger Dionysius, who also expressed a most earnest desire to become acquainted with Plato< Letters were then dispatched to him, from the tyrant, from Dion and several followers of Pythagoras, importuning him to return to Syracuse, and take upon him the education of the young prince. After considerable hesitation, he consented, and is said to have had some kind of promise on the part of Dionysius that he would adopt the Platonic form of government. 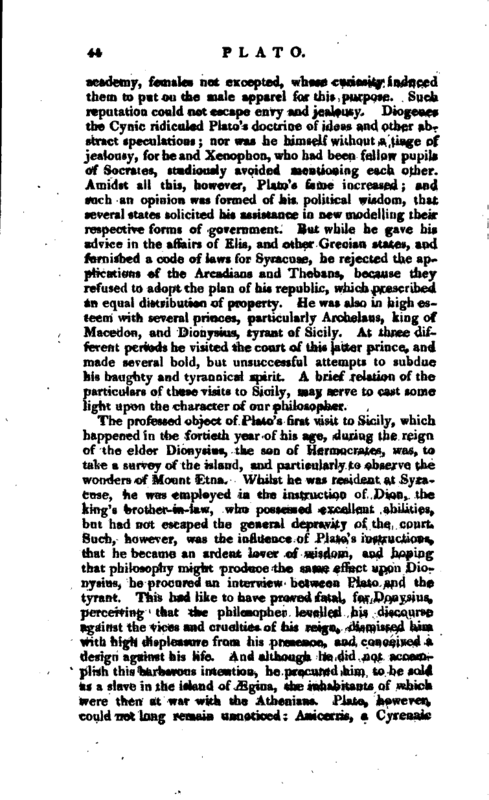 In the mean time the enemies of Dion prevailed upon Dionysius to recall from exile Philistus, a man of tyrannical principles and spirit, who, they hoped f would oppose the doctrines and measures of Plato. The philosopher in the mean time was conducted to Syracuse with public honours; the king himself received him into his chariot, and sacrifices were offered in congratulation of his arrival. New regulations were immediately introduced; the licentiousness of the court was restrained; moderation reigned in all public festivals; the king assumed an air of benignity; philosophy was studied by his courtiers; and every good man assured himself of a happy revolution in the state of public manners. It was now that Philistus and his adherents found means to rekindle the jealousy of the tyrant, and through their intrigues, Dion became so obnoxious to Dionysius, that he ordered him to be imprisoned, and afterwards banished him into Italy. With Plato, however, he continued to keep up some appearance of friendship, and under that pretence allotted Plato an apartment in his palace, but at the same time placed a secret guard about him, that no one might visit him without his knowledge. At length, upon the commencement of a war, Dionysius sent Plato back into his own country, | with a promise, that he would recal both him and Dion upon the return of peace. 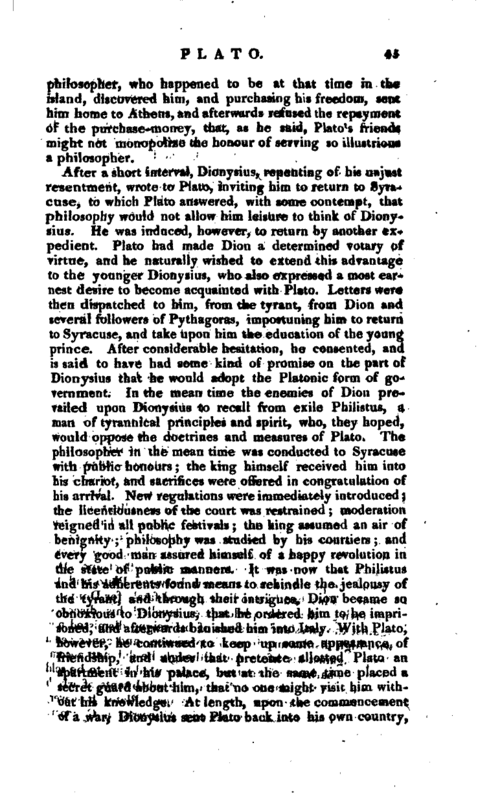 Part of this promise he was soon inclined to keep, by recalling Plato but the philosopher received his solicitations with coolness, pleaded in excuse his advanced age, and reminded the tyrant of the violation of his promise respecting Dion nor was it until the request of Dionysius was seconded by the intreaties of the wife and sister of Dion, and by the importunities of Archytas of Tarentum, and other Pythagorean philosophers, to whom the tyrant had pledged himself for the performance of his promises, that he could be prevailed upon to return. On his third arrival he was received with great respect by Dionysius, who now seemed wholly divested of his former resentments, listened to his doctrines with pleasure, and presented him with eighty talents in gold. The court indeed was not much improved, nor was the disposition of the tyrant really changed, yet Plato supported the credit of philosophy with great dignity, and had considerable influence and authority. But as he soon found that he could not procure the recall of Dion, and that there was little sincerity in the professions of Dionysius, he requested permission to return to Greece. The permission was granted, and a ship provided; but before it could set sail, Dionysius retracted his promise, and detained Plato in Syracuse. This conduct being attended with complaints on the part of Plato, the tyrant was so irritated as to dismiss him from his court, and put him under a guard of soldiers, whom false rumours had incensed against him. His Pythagorean friends at Tarentum, being informed of his dangerous situation, immediately dispatched an embassy to Dionysius, demanding an instant completion of his promise to Archytas. The tyrant, not daring to refuse this demand, with a view to pacify Plato gave him a magnificent entertainment, and sent him away loaded with rich presents. Plato, now restored to his country and his school, devoted himself to science, and spent the last years of a long life in the instruction of youth. 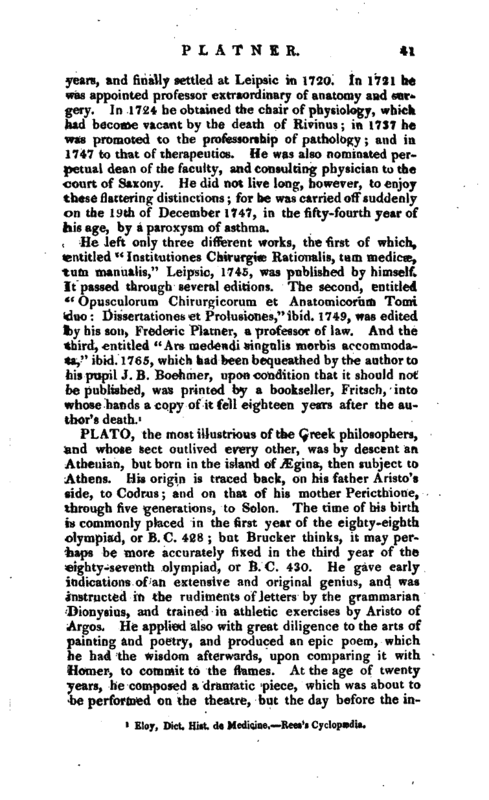 Having enjoyed the advantage of an athletic constitution, and lived all his days temperately, he arrived at the eighty-first, or, according to some writers, the seventy-ninth, year of his age, and died, through the mere decay of nature, in the first year of the hundred and eighth olympiad. He passed his whole | life in a state of celibacy, and therefore left no natural heirs, but transferred his effects by will to his friend Adiamantus. The grove and garden, which had been the scene of his philosophical labours, at last afforded him a sepulchre. Statues aad altars were erected to his memory; the day of his birth long continued to be celebrated as a festival by his followers; and his portrait is to this day preserved in gems. It is from the writings of Plato, chiefly, that we are to form a judgment of his merit as a philosopher, and of the service which he rendered to science. No one can be conversant with these without perceiving, that his diction always retained a strong tincture of that poetical spirit which he discovered in his first productions. 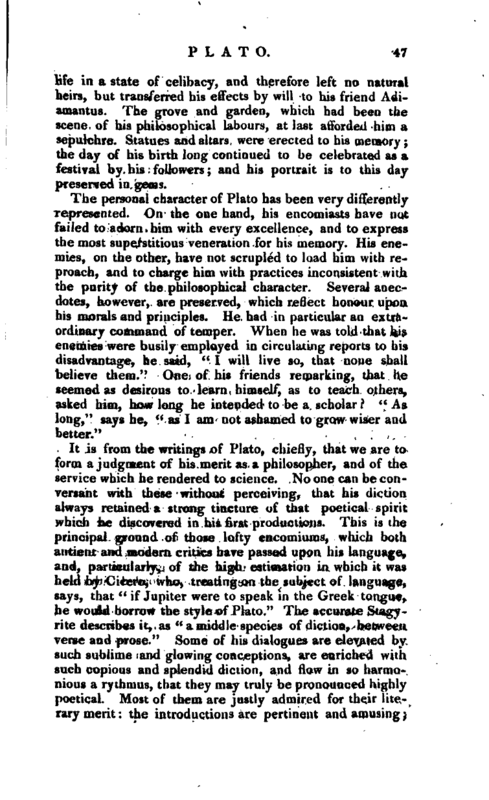 This is the principal ground of those lofty encomiums, which both autient and modern critics have passed upon his language, and, particularly, of the high estimation in which it was held by Cicero, who, treating on the subject of language, says, that “if Jupiter were to speak in the Greek tongue, he would borrow the style of Plato.” The accurate Stagyrite describes it, as “a middle species of diction, between verse and prose.” Some of his dialogues are elevated by such sublime and glowing conceptions, are enriched with such copious and splendid diction, and flow in so harmonious a rythmus, that they may truly be pronouncedhighly poetical. Most of them are justly admired for their liter rary merit the introductions are pertinent and amusing | the course of the debate, or conversation, is clearly marked; the characters are accurately supported every speaker has his proper place, language, and manners the scenery of the conference is painted in lively colouring and the whole is, with admirable art, adorned and enlivened by those minute embellishments, which render the colloquial mode of writing so peculiarly pleasing. Even upon abstract subjects, whether moral, metaphysical, or mathematical, the language of Plato is often clear as the running stream, and in simplicity and sweetness vies with the humble violet which perfumes the vale. In these beautiful parts of his works, it has been conjectured, not without probability, that Socrates and Lysias were his models. At other times, however, we find him swelling into the turgid style, a tincture of which he seems to have retained from his juvenile studies, and involving himself in obscurities, which were the offspring of a lofty fancy, or were borrowed from the Italic school. Several ancient critics have noticed these blemishes in the writings of Plato. Dionysius Halicarnassensis particularly censures Plato for the harshness of his metaphors, and his bold innovations in the use of terms, and quotes from his Phædrus examples of the bombast, the puerile, and the frigid style. The same inequality, which is so apparent in the style of Plato, may also be observed in his conceptions. Whilst he adheres to the school of Socrates, and discourses upon moral topics, he is much more pleasing than when he loses himself, with Pythagoras, in abstruse speculations. The Dialogues of Plato, which treat of various subjects, and were written with different views, are classed by the ancients ufider the two heads of Didactic and Inquisitive. The Didactic, are subdivided into Speculative, including physical and logical and Practical, comprehending ethical and political. 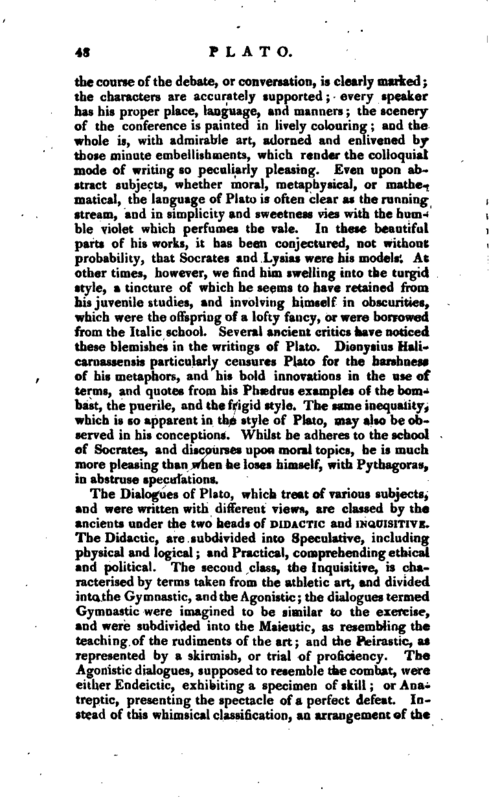 The second class, the Inquisitive, is characterised by terms taken from the athletic art, and divided into the Gymnastic, and the Agonistic; the dialogues termed Gymnastic were imagined to be similar to the exercise, and were subdivided into the Maieutic, as resembling the teaching of the rudiments of the art; and the Peirastic, as represented by a skirmish, or trial of proficiency. The Agonistic dialogues, supposed to resemble the combat, were either Endeictic, exhibiting a specimen of skill or Anatreptic, presenting the spectacle of a perfect defeat. Instead of this whimsical classification, an arrangement of the | dialogues, taken from the subjects on which they treat, would be much more obvious and useful. They may not improperly be divided into physical, logical, ethical, and political. The writings of Plato were originally collected by Hermodorus, one of his pupils: they consist of thirty-five dialogues, and thirteen epistles. They were first published by Aldus Manutius, at Venice, in 1513, 2 vols, folio. The subsequent editions of Ficinus and Serranus are the most valuable; but the notes and interpretations of both are to be read with caution, as not representing Plato’s sentiments with fidelity. The Deux Ponts edition of 1781, 12 vols. 8vo, is a copy of the Greek of Serranus, and the Latin of Ficinus. Of the “Dialogues of Plato,” an edition was published by Foster at Oxford, 1745, 8vo, reprinted in 1752 and 1765. 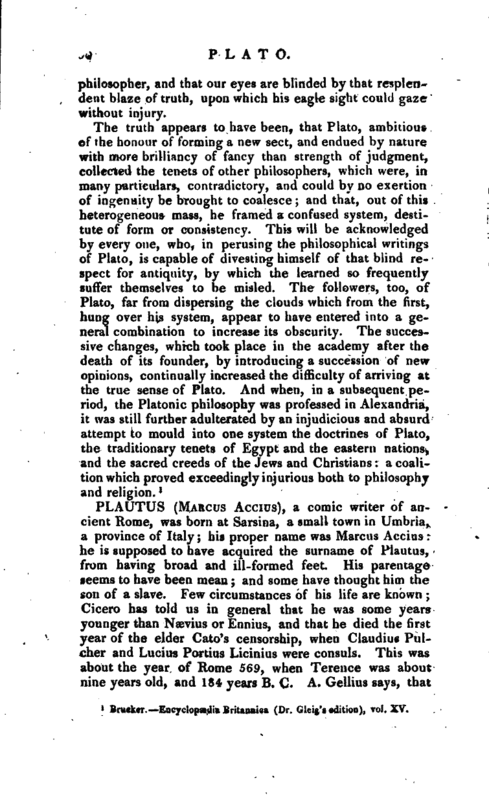 In 1771, Etwall published, at the same place, the “Alcibiades,” and “Hipparchus;” to which he prefixed the life of Plato by Olympiodorus, and the introduction of Albinus. The “Euthydemus” and “Gorgias” were also published at Oxford in 1784, by the very learned Dr. Routh, president of Magdelen college. There are many English translations of the Dialogues, but none superior to those by Floyer Sydenham, published in four volumes, from 1767 to 1780. 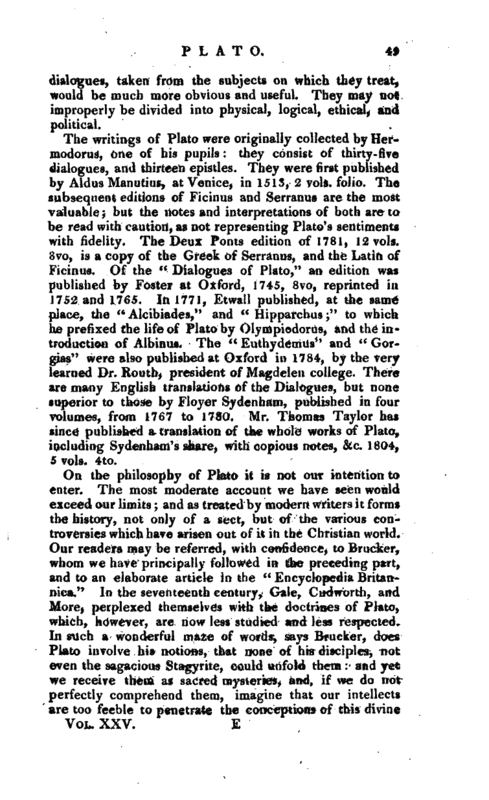 Mr. Thomas Taylor has since published a translation of the whole works of Plato, including Sydenham’s share, with copious notes, &c. 1804, 5 vols. 4to. On the philosophy of Plato it is not our intention to enter. The most moderate account we have seen would exceed our limits; and as treated by modern writers it forms the history, not only of a sect, but of the various controversies which have arisen out of it in the Christian world, Our readers may be referred, with confidence, to Brucker, whom we have principally followed in the preceding part, and to an elaborate article in the “Encyclopedia Britannica.” In the seventeenth century, Gale, Cudworth, and More, perplexed themselves with the doctrines of Plato, which, however, are now less studied and less respected. In such a wonderful maze of words, says Brucker, does Plato involve his notions, that none of his disciples, not even the sagacious Stagyrite, could unfold them and yet we receive them as sacred mysteries, and, if we do nctf perfectly comprehend them, imagine that our intellects are too feeble to penetrate the conceptions of this divine | philosopher, and that our eyes are blinded by that resplendent blaze of truth, upon which his eagle sight could gaze without injury. 1 Brukr. Encyclopedia Britanniea (Dr. Gleig’s edition), vol. XV.